So this is Blog Democracy. I gave my readers the option of choosing my next post and, as a result, you are now going to hear all about the exercises that old Chinese people do. Mind you, I do not actually know anything about these activities aside from what I've seen, so the commentary you are getting will be that of a un-educated anthropologist. Expect me to use the words "weird" and "silly" a lot. Veronica, as an anthropology major, insists that the terms are "culturally differentiated" and "idiosyncratic", but I'll stick with "weird" and "silly" here. You'll know what I mean. This ancient and boring martial art originated in Handan. Traditionally it is practiced first thing in the morning and gets the blood flowing. It is a slow moving, meditation-based movement activity and is often done as a community. 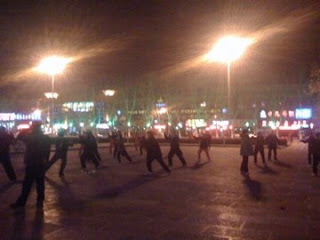 In Handan, they actually love Tai Chi so much that they practice it at night in parks as well. Tai Chi is practiced world wide, so it isn't really unique to China anymore - even if it was invented here. This is more idiosyncratic - oops, I mean "weird". I've noticed, middle age and older Chinese doing what I can only describe as "general stretches and self flagellation". Sometimes this is done as a solo activity, other times in groups. I first noticed this when returning from the gym in early spring. The lobby of the building was crowded with older women who were putting their feet on the walls (stretching) and then smacking their legs with their hands (self flagellation). This meeting seemed to take place on a regular basis. Since first noticing it, I've become aware of this exercise taking place all around me. It is not uncommon for you to encounter someone walking down the street while beating themselves on the arms, legs or shoulders. This takes place on the bus, on airplanes and waiting for lines in supermarkets. I've also noticed awkward aerobic activity - but NO running out doors or active cycling. People will walk sideways, taking big steps or they will walk up stairs backwards. This is fairly western, but it is usually done in normal, everyday clothes - thus making it weird. I don't have a picture of this, because I felt really weird taking a picture of someone beating them self on the bus. Almost as popular as Tai Chi is ballroom dancing. This often takes place in parks and is often to random western songs (Jingle Bells, White Christmas, etc). Its not uncommon to see white tourists joining in the fun. This is particularly fun to watch as it makes the experience EXTRA awkward. This seems to be a genuine exercise and the parks fill up with dancers on nice days. This comes from the Red Army department. When in the forbidden city (not so forbidden actually), I happened across a group of trainee soldiers practicing martial arts. This was pretty awesome. Dan's camera has the ability to isolate colors and made the practice look extra awesome.